Whenever there’s news of a cruelty-free brand getting acquired by a company that tests on animals, many caring consumers are left frustrated and heart broken as they decide to support or boycott these cruelty-free brands under its new, non-cruelty-free owners. Some people choose to boycott and avoid buying from brands that are owned or have been acquired by a corporation that chooses to test on animals for a number of reasons, which I discuss in more detail in this post, but I find the #1 reason is because they feel that their money is financially supporting and funding more animal tests done by the parent company. On the flip side, some people choose to continue to buy from cruelty-free brands that are owned by a parent company that tests on animals because they believe it’ll show the parent company that there’s a high consumer demand for cruelty-free brands and hopefully they can see that and it’ll incentivize them to stop testing on animals altogether. There isn’t a “right” or “wrong” answer and as consumers, we’re at liberty to buy from whichever brands we want but I think it’s equally important to familiarize ourselves with some of the cruelty-free brands that are under the same umbrella as a parent company that chooses to test on animals. Keep scrolling to find 18 beauty and household brands that are cruelty-free however they are owned by a company that tests on animals! “We do not test any of our products on animals. Our products are not tested on animals on our behalf by any third party. The questions of animal testing. L’Oréal has developed a very rigorous safety evaluation procedure of its products, backed by research. Well before the question of animal testing was raised by civil society or within a regulatory framework, L’Oréal has been committed to new methods of assessing safety that don’t involve animals. A true pioneer, L’Oréal has been reconstructing human skin models in laboratories to elaborate safety tests since 1979, as an alternative to animals. In 1989, L’Oréal completely ceased testing its products on animals, thus 14 years before the regulation required so. Since 2013, L’Oréal has completely stopped testing ingredients on animals. Only one exception remains for L’Oréal just like all other cosmetic companies: the health authorities in China require some tests on animals for certain products or ingredients. L’Oréal has been committed to working alongside the Chinese authorities and scientists to have alternative testing methods recognized, and permit the cosmetic regulation to evolve towards a total and definite elimination of animal testing. Thanks to this, since 2014, certain products manufactured and sold in China like shampoo, body wash or make-up are no longer tested on animals. “Bumble and bumble, LLC. is committed to the elimination of animal testing. We are equally committed to consumer health and safety, and bringing to market products that comply with applicable regulations in every country in which our products are sold. Thank you for caring. Last time I went into a CVS to shop for cruelty free makeup I almost had a melt-down because it’s so difficult to figure out which line is owned by a parent company that does test on animals. I stood there with my phone doing research that left me frustrated and scared. As animal lovers, we need to keep each other informed as to what is TRULY cruelty free. Things are always changing and we need to keep up. I will never support any line whose parent company tests on animals. It’s a constant struggle animal lovers are dealing with. My fave go to brand is Collection sold in Boots and Superdrug ?? I don’t think Bumble and Bumble are cruelty free, I’ve been researching them this evening because my boyfriend wanted a product from there – I’ve seen the brand blacklisted on many blogs about cruelty free products, and it’s actually on the PETA website itself, I don’t know why you have it listed as a PETA approves cruelty free brand!! I read the statement you posted they say “we never test on animals – apart from when it’s required by law” I.e. in China. No brand that sells their product in China is cruelty free. I think you need to remove this from your list as you are giving people the wrong information. Yes, I am aware that there are some mixed reviews online about Bumble & Bumble’s cruelty-free status. I’ll update this post to include this disclaimer however the only reason I included them on this list was because they were in fact, certified cruelty-free by PETA so I wanted to make sure anyone who thought they were cruelty-free and wasn’t aware about their parent company, Estee Lauder.. would now be informed with this blog post! Thank you so much for publishing this list. 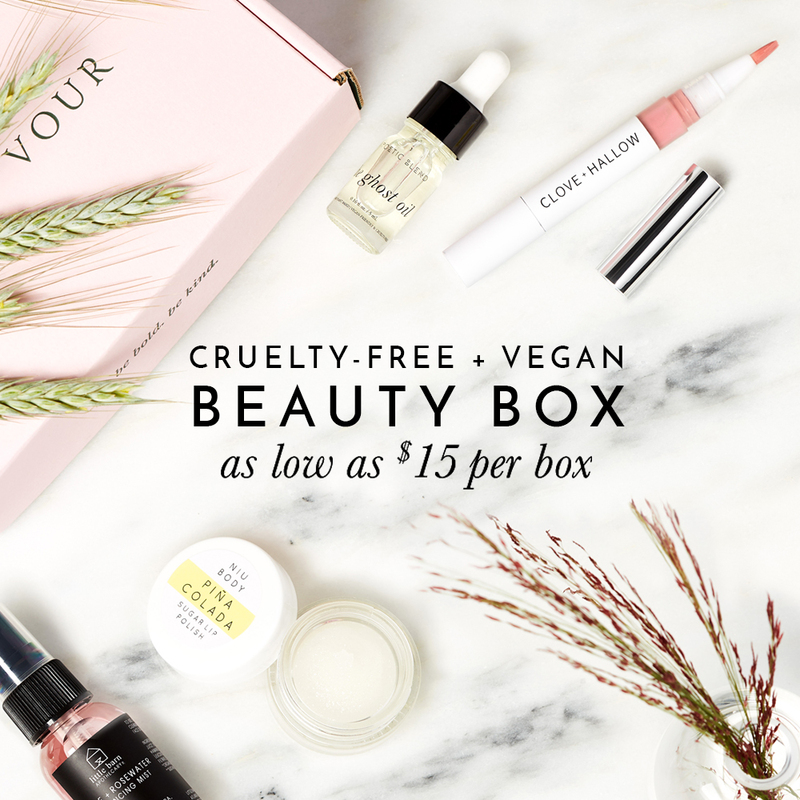 I’m new at the whole cruelty free ‘thing’ and this list is a great help. Although I’m crushed to see Tarte on it. The only truly waterproof mascara I’ve found….ugh! I work in a hot sweaty kitchen and have struggled to find one that truly works. Tarte Also has a great eye shadow pallet without a whole bunch of outrageous colors or shimmery tones. I was thrilled when I found it. I’ve tried some others, but they still smudge a bit. I like others here are not big online shoppers, so if I can’t get it at Target, Walmart, or Sephora then I just wind up settling on anything, being disappointed and then throwing it and my money away. What’s your take on the new line by Rhianna….I’ve heard it’s cruelty free, although I would imagine it’s sold in China. Thank you for posting this. I find it so hard to go to places like Target and find brands that aren’t tested either themselves or by parent companies. I have such a limited access and I’m not a huge online shopper. Of the brands I’ve heard of, I knew most of them had animal testing parent companies but I didn’t know about Murad which is disappointing as they are my favourite luxury brand. I avoid parent companies when possible, especially Unilever, Proctor & Gamble and L’Oreal as they are major animal abusers. Luckily I only have 1 Murad product at the moment and it’s almost ran out. In a way this is a good thing as it will make me search for a totally cruelty free replacement.